Why is it right to give illegal aliens the right to vote in America? Are we a country of laws, or not? This isn't just some kind of legal resident status (which would be bad enough), Trump is saying we have to give every illegal full citizenship including voting. No we don't have to do that! No that's not right! I'm not surprised that Trump is a squishy leftist. I already knew Trump was a protectionist with no clue about the free market. I already knew Trump praised Obama in 2009. I already knew Trump favors eminent domain, doesn't like guns, is pro-choice, has New York values, sympathizes with social justice warriors, and isn't very religious. I knew Trump favors big government healthcare because he has a "heart". And Trump favored taking in Syrian refugees, and funding Planned Parenthood, before changing his position. I already knew Trump doesn't want to cutback on Social Security and Medicare. His ridiculous entitlements plan (that he advocated at CPAC 2013 and 2014, not just on the campaign trail today) is no reforms or cutbacks, just grow the economy and don't worry about spending. Trump is not a small government kinda guy. I already knew Trump had praised Hillary Clinton, Harry Reid, Nancy Pelosi and Al Sharpton. I already knew he was involved with some of the worst leftists. I already knew thinks he can make deals with the left as President, instead of standing up to the Washington Cartel. I already knew that Trump was squishy as hell on Free Speech – when Muslim terrorists attacked a free speech event in Texas, Trump questioned why people say offensive things that "taunt" Islamofascists. The assumption Ann's readers will make is that Trump is against suicide. Nope. Trump was demanding suicide! He wasn't saying, "It's suicide, don't do it." He was saying, "It's suicide, so be 'careful' with it, but we 'have to' do it anyway because it's 'right'." How can Ann take a speech where Trump advocates giving every illegal alien the right to vote in US elections – even though he thinks this will destroy the Republican party – and then tell us to support Trump (as a Republican!) because he's great on immigration? Why is Ann covering for Trump on the one issue she cares about? 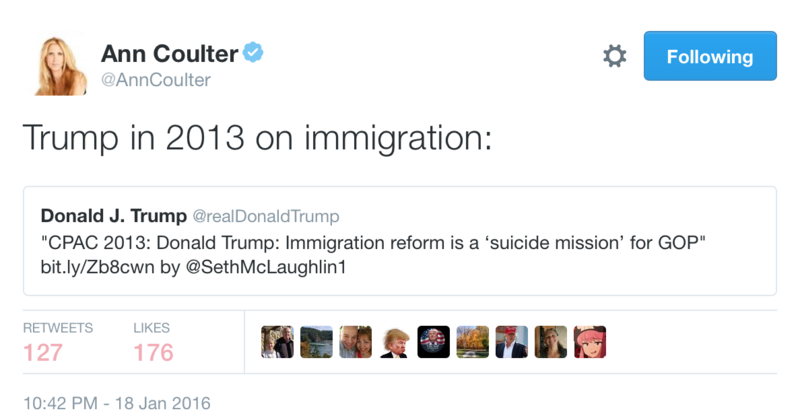 Ann told us that Trump was the one guy joined her in opposing immigration in CPAC 2014. This transcript isn't perfect. He actually said it twice in the video at 14:50: "Now with that you have to do what's right. You have to do what's right. It's not about the votes necessarily." Trump emphasized doing what's "right". Regardless of who they're going to vote for, you have to do the right thing. Let them vote even though it will be for Democrats. That means amnesty. I support Ted Cruz who has wanted to build a wall since at least 2012. Cruz, besides being better than Trump on individual issue after issue, is smarter and more principled. Cruz favors free markets, limited government, and liberty in a way Donald Trump doesn't understand.